"Big Goal Round!" This interactive mod will light up your TV Award and Final Draw Scoop with a Green glow when the TV Award is active and Purple when the Final Draw is active. Each TV Award and Final Draw Scoop Light Assembly is individually handcrafted using quality materials. The Green and Purple LED bulbs draw very minimal current and provides long life. Installation is easy with the included instructions. The lights are connected with alligator clips. 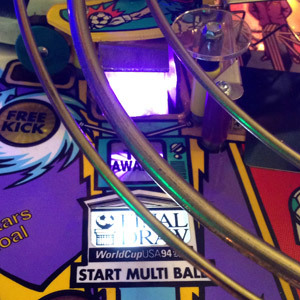 No permanent playfield modifcations, No Soldering, and No wire cutting is required. Shown with Green and Purple Lights. Other colors available upon request.